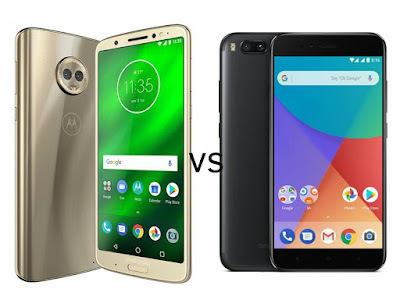 Moto has introduced Moto G6 Plus with Dual Rear Camera, 18:9 Display, Xiaomi Mi A1 also comes with Dual Rear Camera and Stock Android.Checkout Price, Specs, Features comparison between Moto G6 Plus and Mi A1. Moto G6 Plus come with 3D Glass body whereas Mi A1 has Metal body, Moto G6 Plus supports TurboCharging which lacks in Mi A1. Moto G6 Plus comes in Deep Indigo and Nimbus color priced at €299/R$ 1,599.00, Mi A1 is priced at Rs 13,999 in India. Moto G6 Plus offers 18:9 Display whereas Mi A1 has 16:9 Display.